The Cocoa Diaries: Chick, Chick, Chick, Chick - Chicken! So off I headed to the Horniman Museum for what I thought would be a relatively calm and serene Sunday afternoon event. THIS IS WHAT I WAS FACED WITH. 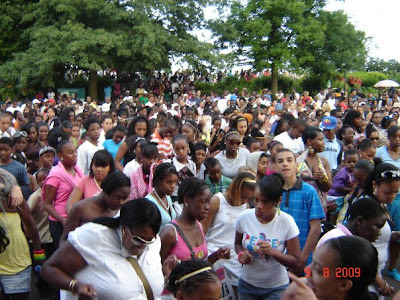 Was soooo not prepared for the madness, mayhem and exceedingly long queues of yesterday's Jerk Cookout festival which took place in Forest Hill, South East London. I went to the same event about 3 years ago and there were literally about 500 people I'd say. Yesterday, apparently the numbers were in the region of 20,000 plus. Wowser. I'm really happy for Tony Fairweather and his team who put the event together, but I'm really not certain if they'll be able to hold it at the same venue next year if it continues to grow so rapidly. And admittedly, it is a good idea. The initial format was to have a handful of Caribbean food caterers battling it out to see who could make the baddest, lip smacking jerk chicken. This year I think they scrapped the competition element and instead opted for loads of Caribbean food stalls selling their mouth watering cuisine to plenty of willing customers. The queues were huge people - I'm talking an hour's wait for a piece of jerk chicken. Yeah it tasted good, but the verdict is still out on whether it was worth such a long wait. This year along with the food stalls, they also added 2 stages with live music, PA's and even attempted a world record of 5000 people doing 'The Candy Dance' simultaneously. Would love to tell you how that went but was too busy standing in line for chicken. Hour's wait for some Jerk Chicken? Girl, I hope it tasted GOOD!!! Wow, people were not playing. Wish I went, roll on next year. Oh my days! I was there and ended up just vex on what was a lovely day because after a wait of over an hour for jerk chicken and rice and peas, i ended up with some below-par semi-seasoned chicken and awful r&p. OH MY. I, I, I ... don't think I could do it.